It should be easy, right? Just measure the boards, cut the miters, and nail the trim in place. Well, not exactly. 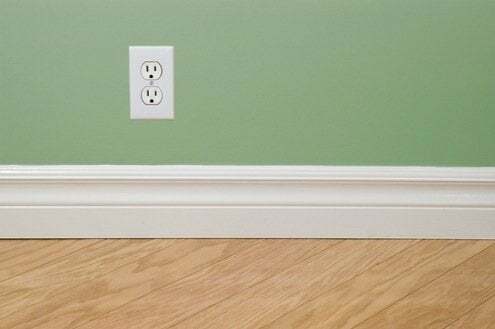 If you’ve ever tried to install baseboard on your own, then you would probably agree that looks can be deceiving. All too often a DIY baseboard installation is compromised by gaps or ill-fitting joints, resulting from walls that aren’t flat, floors that aren’t level, or corners that aren’t square. Inside corners can be especially tricky to pull off. For a tight fit, use a coped joint. A mitered corner might be ideal for an outside corner, but an inside corner joint will be better formed if you cope the profile of one baseboard to fit snugly against the contours of its mate. 1. Make a miter cut on one board, then clamp the piece to a worktable. 2. Using a utility knife, file, or sander, trim the pointed edges left by the miter cut to help prevent slips. 3. 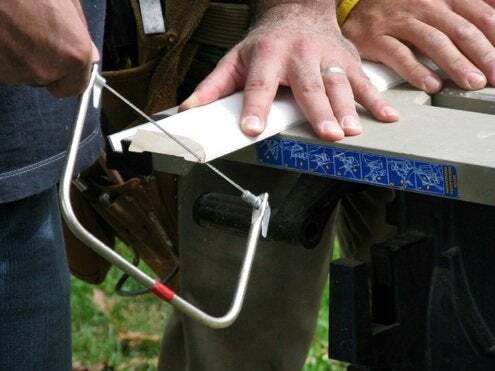 Turn the blade of your coping saw 90 degrees to the frame of the saw and back-cut along the lead edge of the miter cut. 5. Test the fit by butting a square-cut piece of molding against the coped edge of your baseboard, making any necessary adjustments with your saw or file. 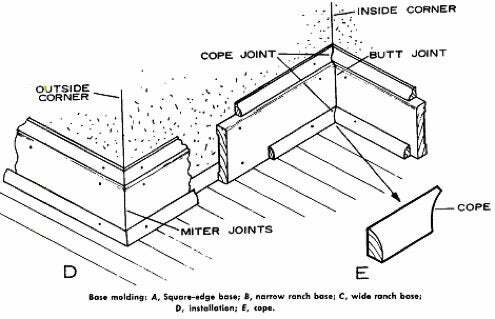 Whereas a coped joint is recommended for inside corners, a mitered joint is appropriate for outside corners. For a clean mitered corner, it’s a good idea to cut your baseboard about 1/16–inch longer than necessary. Doing so ensures a tight fit by enabling you to “spring” the next board into position. As you install baseboard, or any trim for that matter, expect to do some re-cutting. It’s all part of the game. Be careful to not leave yourself too short, though. • Prior to installation, use a putty knife or paint scraper to clean excess material from the wall and floor. • If you are working in a room that will have carpeting, make sure to install baseboard at least 1/2-inch off the floor. That way, the carpet installer will be able to tuck the carpet edges beneath your trim. • To speed the work (and avoid unsightly hammer marks), buy or rent a finish nail gun in combination with a compressor, or use a cordless finish nailer. • Standard 3/8-inch baseboard is a lot more flexible than 3/4 or 5/8. Greater flexibility means greater success when trying to fit baseboard snugly against an uneven wall. Construction adhesive helps, too. • Do everything you can to make the trim fit tightly, but when you can’t, it’s okay to fill small gaps with caulk prior to priming and paint.